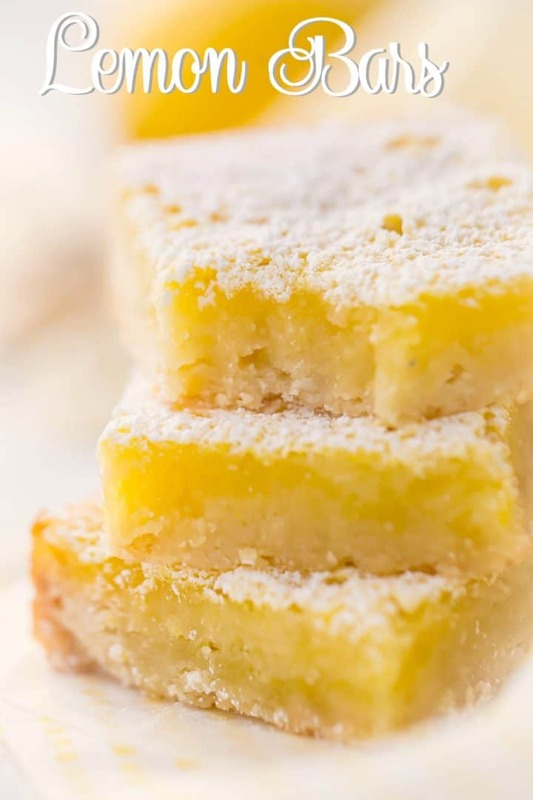 Lemon Bars: a beloved classic treat! Buttery shortbread crust, tangy lemon filling, and a dusting of powdered sugar on top. So bright, citrus-y, & happy! So, as I mentioned yesterday, it’s Superbowl week! Gah! Can you believe it? What are your plans? We’ll be getting together with friends and FEASTING. I have some of the best friends, and they make the BEST food! I know there will be lots of great choices, and of course I always bring dessert. When it comes to desserts that are easy to tote along, bars win hands-down. Just stack ’em and pack ’em, and you’re good to go! Some of my favorites include these unbelievably rich and chocolate-y brownies, these sweet and buttery blondies, and of course cheesecake bars! But the list wouldn’t be complete without that beloved classic: lemon bars! 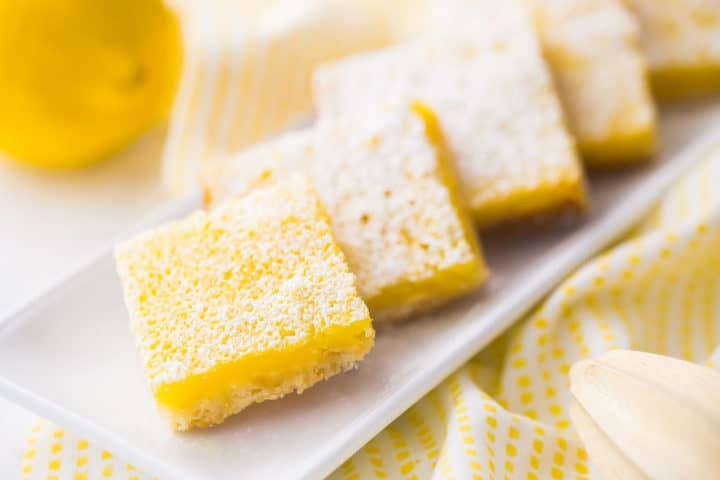 Lemon bars are such a classic treat! I especially love them at this time of year, because they’re so tart and tangy, they just seem to brighten everything right up. Just what we need when it’s dark, gloomy, and cold! 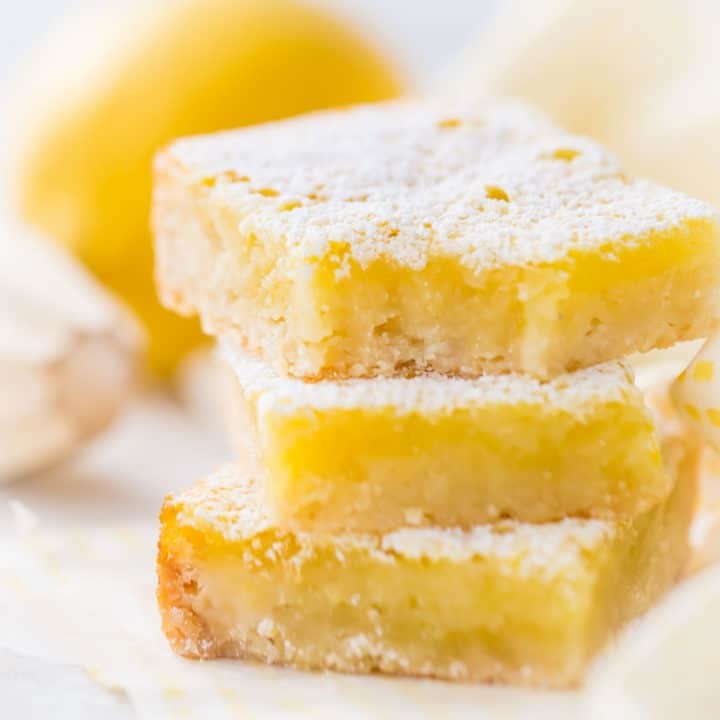 They consist of a buttery, crumbly shortbread base, topped with a sticky layer of gooey lemon goodness that’s similar to a thick lemon curd. A generous dusting of powdered sugar on top really balances out all the flavors. You get buttery, almost savory crust, bright tangy citrus, and sweet sugar on top. It’s such an incredible combo and this dessert is perfectly portable, so it’s a great treat to bring to a party. This recipe is quick and easy to make, with just a few simple ingredients. Start with the bottom layer: the shortbread crust. Whisk flour, powdered sugar and salt together in a big bowl, then add in the cold butter. Work the butter in until the mixture resembles coarse crumbs. I like to use a pastry blender for this step, but you could also use two knives or just your fingers. Press this mixture into the bottom of the pan, and give it a quick par-bake to help it set. While that’s going, you can mix up the filling. It’s just sugar, a little flour, eggs, lemon zest, and lemon juice. I highly recommend using fresh lemons for this recipe- the flavor is amazing! You’ll love how bright and tangy these bars come out when you use the real deal. Pop it back in the oven, and bake! Lemon bar filling can sometimes be a little tricky! It’s meant to be sticky and a little gooey, so sometimes it can be hard to tell when it’s done. If you look at your bars after the recommended bake time, and the filling looks loose, runny, or too liquid, give them more time. You’ll know your lemon bars are done when the edges are starting to turn golden, and the filling is set and no longer wobbly in the center. Lemon bars can be tricky to get out of the pan, if you don’t know what you’re doing! That top layer tends to be pretty sticky, so it’s not as simple as just flipping them onto a cutting board. Here is what I recommend: mist your pan with non-stick spray and line it with parchment, prior to assembling the bars. If you’re not sure what that looks like, check out this post: How to Line Pans with Parchment. If you’ve done it right you will have some overhang on 2 sides. This overhang works just like a handle. Run the blade of a thin, sharp knife around the sides, then grasp the parchment “handles” firmly, and the bars should lift right out. Place them on a cutting board and cut into bars. I like to use this kind of knife, pushing straight down through, and rinsing it with hot water after each cut. It works so great! I should also say that it’s DEFINITELY best to cut your bars once they are completely cool. If they are still warm when cut, things could get really messy! If you plan on eating your lemon bars within a day or so of baking them, there is no need to refrigerate them. Just place the bars in an airtight container, stacking them with a sheet of parchment or wax paper between each layer. But lemon bars can definitely be made ahead- they’re great for that. Just pop the airtight container into the fridge for up to a week or so. Or, if you plan on storing them for longer than that, they can be frozen. Just thaw at room temperature for a few hours before serving. 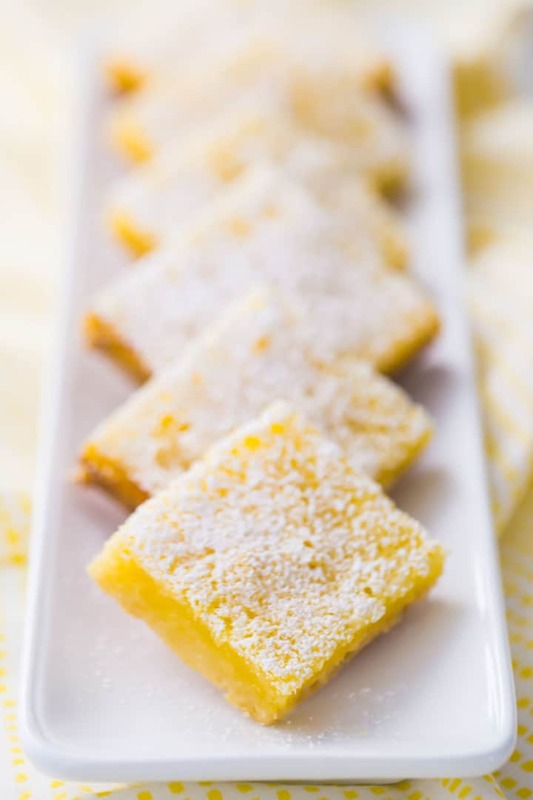 Whatever you end up doing for the big game, I KNOW that these lemon bars will put a smile on everybody’s face! How could anyone not feel happy with one of these sunny, sweet treats in their hand?? Enjoy! Preheat the oven to 350 degrees F, mist an 8x8 pan with non-stick spray, and line with parchment. Place the flour, powdered sugar, and salt in a large bowl and whisk to combine. Press the mixture into the bottom of the prepared pan in an even layer, and bake for 20 minutes. Whisk the sugar, flour, eggs, lemon zest, and lemon juice together in a large bowl. Pour the filling over the partially-baked crust and bake for another 25 minutes, or until the filling is set. Cool completely, cut into squares, and dust with powdered sugar for garnish. I love lemon bars! They look so delicious!